The aim of this study was to evaluate the electrochemical corrosion mechanism of AZ31 magnesium alloy by monitoring acoustic emission (AE). AE signals were monitored in situ during the potentiodynamic corrosion test. Evolution of AE signal appeared to be divided into four distinct stages (AE stage I, II, III, and IV) according to the corrosion time and mechanism. 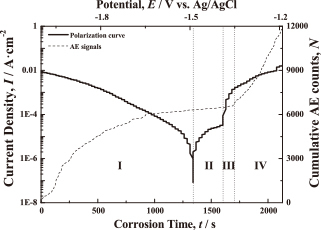 AE characteristics in each AE stage were correlated with the bubble behavior, reflecting corrosion mechanism. This interpretation was verified with the simultaneous observation of corrosion bubbling by video camera.